The idea behind Mimo's 710S 7-inch LCD monitor is to be less space-consuming than a full second monitor, and a lot cheaper, particularly as it only connects via USB – no dual-display graphics card necessary. Just install the drivers and away you go. It's most useful for people with business PCs where graphics card upgrades often aren't an option. Truth be told, this idea met with mixed reactions in the TechRadar office. Some people thought it was a useful idea, some thought it was just too small. However, when the unit was taken home and shown to Miss TechRadar, the reception was massively enthusiastic. She loved the idea of having her calendar separately visible, and liked the sleek look of it too. Suddenly, the surprisingly handsome design of the monitor made sense. We'd been struck by the seemingly unnecessary design flourishes when unpacking it. Dell's aesthetics spring to mind, thanks to the clean lines and round grey logo, but it's more 'Studio' than 'Latitude', and clearly Mimo is looking to appeal to home users as well as offices. 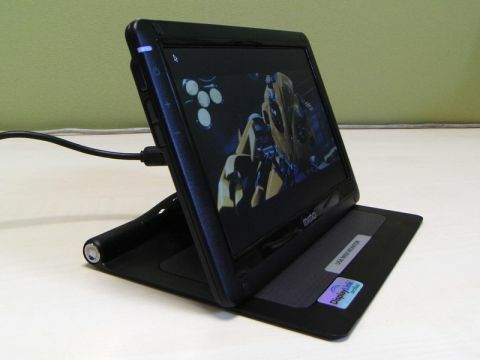 Handily, it folds down to 25mm in thickness, making it ideal for carrying around with your laptop. There's enough acreage in the 800 x 480 screen to keep Outlook or a similar calendar or email client visible permanently without taking up any of your main screen. The choice of landscape or portrait makes it quite flexible for different programs. The screen quality is actually pretty good. The 350cdm2 brightness is fairly good for monitors, so there's no squinting to make out different part of the image. The contrast ratio isn't great, but then it's a 7" monitor, so it seems a bit nit-picky to complain about that when 400:1 is perfectly adequate. That last sentiment kind of sums up our opinion of this monitor. It's not supposed to blow you away – it's 7-inch and powered entirely by USB. It only has to be functional, but instead it's good enough to watch videos on. It only has to be black and plain, but instead it's eye-catching and desirable. Mimo's monitor might not seem necessary to everyone, but we'll really miss the convenience when it's gone.